Auditions don't have to be so terrifying. After all, the directors are looking for your talent, energy, and good work ethic. In my experience, auditors are hoping you will succeed, wanting you to nail the audition....believe me, they want to hire you. You just need to show them your best self, your best work, and that you are a likable, "directable" and willing to do the work. This is exhibited all in your 3-minute audition! 1. The audition is well-rehearsed and well-prepared. There is nothing worse than a halfway memorized, kinda-sorta blocked song or monologue with no-real interpretation or thought. Believe it or not, this is what gets most people in trouble. If you put in the time and effort before the audition, those 3-5 minutes will go so smoothly and quickly, and before you know it, you've got a call back. Spending the time on preparing a strong, solid piece reduces your anxiety and gives you confidence. 2. Research and understand your well-chosen material. Undoubtedly, this is part of preparation. It's amazing how many people don't know the show from which their monologue comes...or that the piece they chose is for a totally different age, gender or type. Get coaching and help in choosing a piece that is right for you, then study the play or musical and be able to speak to it if and when asked. 3. Present yourself well. Your audition begins the moment you walk in the building. We want to see that you are pleasant, kind, courteous and fun. Remember that if you get cast, we will be spending a great deal of our lives together. We aren't just hiring the actor; we are hiring the person. 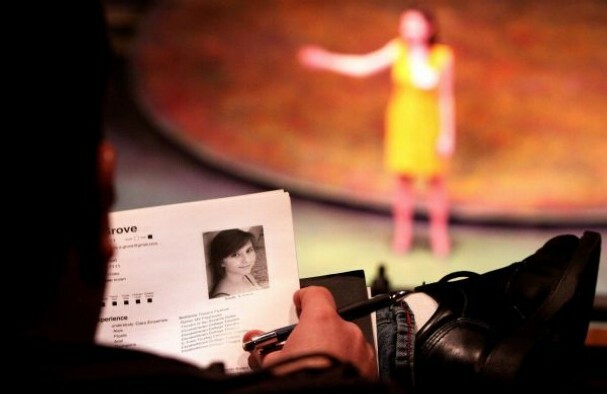 Consider how you are treating others, including the stage manager and the other auditionees. Think carefully about your dress. Professional, modest clothing which still allows you to move and isn't too flashy (including jewelry) is best. Black slacks and a collared shirt are great choices. Walk in and leave the space with confidence and poise, even if you aren't "feeling it." Go to your car to cry and scream. Then go have ice cream. Email us: info@ladedacolorado.org for more information. Spring is here and we're all new! Well, things are certainly changing around here...Nick is packing for his new Maine adventure, Troy has smoke billowing out the side of his pencil as he chases his degree, and Dulcie and I are in a state of feverish excitement to make La-De-Da our new home. It certainly feels like familiar territory as Nick has been mentoring me as a fellow teacher and artist from the minute I landed in Fort Collins. A few summers back, I crafted an entirely new play on the very carpet we will be now holding classes and I’ve had the opportunity to tour that play around the country. Dulcie, Nick, and I have had many Fringe planning meetings while sitting in those cozy cushion chairs, scheming on how to make each year better than the next. I owe a huge debt of gratitude to La-De-Da for their support over the years and Dulcie and I are both so humbled and honored to be stepping into the massive shoes Nick and Troy are leaving behind. But Dulcie and I come to this with big feet ourselves and we know that our missions as independent teachers and artists in the community align perfectly with that of La-De-Da which is why we jumped at this opportunity. We've worked and played together for a few years and we feel confident in carrying on the La-De-Da spirit. So we hope you will stay with us through this season of transition and help us to keep La-De-Da that wondrous playground for the imagination. We look forward to playing with you soon! So on the Fringe, many people haven't heard of it. No, most people. I'm disappointed but not surprised. I have been involved in some very prominent and visible ventures and the percentage of people unaware of that venture is staggering. I've spoken to people who parked in front of our little downtown theatre for seven years and didn't really acknowledge its presence. It had chaser lights around the windows. And a giant sign. But, alas we were no Candy Crush or Pet Rock. Those babies are/were prominent. Those babies were in, baby. Those babies are/were on the main street of public acknowledgment. And Fort Collins main street is quite lovely. We like to walk it. Ah, but when we do stray - the treasures we will find. We lived in Manhattan for a couple of years. One day, I took a side street off of York Avenue (it's major, just go with it) and found the Bryn Mawr Bookstore down some stone steps in a basement. I spent most of those two years in that basement. Off the main drag. Off the beaten path. The treasures I found. The best theatre I saw was off-off Broadway - off the beaten path. You know why the path is beaten? The herd trampled it. The maverick took off through the bramble and found ungrazed pastures. Yep! Fort Collins theater well known and well trod is great. We have great theater here. Not a lot, but stuff with staying power. But the Fringe? That's fresh grazing. That's treasures to be found. I'm going to slam two metaphors together. It's morning. Fort Collins Fringe Festival - Sept. 15, 16 and 17. Free Family Fringe - Sept. 17th 10am-2pm. Take 15 minutes or 15 hours and do some grazing on sweet, sweet new pastures - or find some treasures. Whichever you prefer. In my career as an acting coach and teacher, I've had the same discussion many, so many times. Excited parents fresh from a local casting call for a national agency give me a call. The agent loved their child but suggested some lessons while the star making process gets going. Usually this audition was held in a motel room by "the casting agent for numerous Disney shows". The agent now wants to represent their obviously talented dynamo. They just need a modest fee to get the fame train a rolling. So, what do I say? "Cool! Yeah. Hire me to coach them. I charge hourly. No real experience? Oh, I can get them ready in like ten sessions. Thanks!" I don't. I take acting relatively seriously and I'm still learning 25 years later. Ten sessions isn't going to get the raw talent in consistently working order anytime soon. I share the following "Red flags" that popped up in our conversation. 1. The audition was held in a hotel or motel room. For a reasonable fee, which includes a night's stay and a continental breakfast, the "casting agent" is likely to make a hefty profit depending on the volume of proud flushed parents and their sparkle eyed superstars that they saw over the weekend. Ask yourself -what's the casting agent for Disney doing in hotel in a Small Town, USA looking for talent? There's no talent in L.A. or New York? No one in "the biz" has heard of the internet? 2. "For just this much money..." Casting, modeling, talent agencies don't, as a rule, charge to represent you. Legitimate agents get you work and then get a percentage of what you get paid. Pretty straightforward. BTW, really established and successful agencies aren't having auditions in motel rooms. Actors withsignificant work have to approach them for representation. From my experience, very few will even see you unless you have a resume with some extensive stageexperience. Go figure. So, yes. Classes, coaching and being a patron of the theatre is a pretty good path to being a working actor. I'll bet there's great theatre groups and school in your area. 2. "Casting Agent for such shows as..." - Casting calls and auditions are listed online and in trade papers like Variety and Backstage - or online. Or through major, legitimate agencies. BTW, I can hold an audition anytime for any of those listed in the papers or online and then claim to be "a casting agent forLatest Teen and Tot Disney Hit Show". Yup. 4. "Broadway" or "Hollywood" in the title of the event or opportunity - and nothing to back it up but vague claims and references. I want to see names and bios. I want credibility. I also know that just because someone does something doesn't mean they can teach or mentor that skill. "Those that can't act, teach". Nope. The most respected acting teachers were and are stunning directors, actors and writers. But there are those legends who probably can't or don't want to teach. Daniel Day Lewis is a stunning actor. Viola Davis is so good, she scares me. I have no way of knowing, but they may not be good at or even interested in teaching you how to act. Michael Caine - yes. He wrote a book. Great actor. Great book about film acting. I'll bet Lin-Manuel Miranda of Hamilton would be amazing in a workshop. You may not see that in your lifetime. He's a little busy. 5. "And our actors/teachers are from L.A./New York!" So? I lived in New York. Manhattan, in fact. I worked for a producer ( here it comes - a Tony Award winning Broadway producer. True story. Although very brief. Wasn't my jam. Wonderful woman. I learned a lot.) The point of the "so" is - I saw great work on and off Broadway. I saw mediocre work. I saw really bad work. No less or more quality than I've seen in Colorado or you may see in your area. Talent and good work have nothing to do with where you live or where you are from. 6. "She/He has got IT" So. They make your child a star or at least get them a gig in L.A. or New York. Bam! "In your face, Turner!" (I deserve that.) Now what? Pack your bags. Sell your house. Say goodbye to your friends and family. You're moving. Maybe you try the long distance family thing. Your child just hit the big time. Your life is now changed. Forever. Congratulations. And please get help and guidance. There are way too many sad stories about child actors and their careers and their then chaotic and tragic adult lives and sadly so few good ones. In the cornucopia that is "fame and fortune", I'm like one cranberry. A wrinkled one. I have a modest resume, some nice accolades and such and a record of teaching, writing and directing over 20 years without a distraction. I have never claimed I'd make ANYONE a star. Exact opposite. I communicate very healthy, informed, focused work. We skill build. We make you better at what you want to do. We encourage joy and collaboration and moments of brilliance - of your making. I can't force any of it. I can engage and educate and enhance. I can't do the work for you. If you become a star of stage and screen, it's because you worked hard and work hard and you met some cool people who appreciate you and did good work. If you never become a "star" and just do good work with cool people who appreciate you? We will be no less proud. Good work with good people for good people. The la-de-da way. Q1. When is the Fringe? A. This Thursday, Friday and Saturday night. And Saturday afternoon. Full Schedule here. Q2. Is la-de-da part of it? A. Yup. There are numerous pieces written and performed by la-de-da young adults, written by Nick Turner and performed by la-de-da adult actors. And we are sponsoring the Free Family Fringe. Q3. There are la-de-da adult actors? A. Yeah, boy! We aren't just for kids. We have a bunch of adult actors in class and a very adult improv group called Be Glorious! Q4. So, The Fort Collins Fringe Festival is for the whole family? A. NO! Many pieces have adult language and adult situations. Check the info. BUT, we are sponsoring the Free Family Fringe on Saturday afternoon. That event is family friendly. Free entertainment, food trucks and you can perform if you want! Just come on down. More Information. Q5. It's expensive, isn't it? A. That's kooky talk. $2 buys you a token to see any one of the pieces. $2. You probably have $2 on the bottom of your backpack, purse or other stuff carrying accessory. Q6. It's really long isn't it? A. More kooky talk! Some works are just 15 minutes long. 15 minutes! And it will be the coolest 15 minutes you've had - ever. Q7. Can't I just wait until these shows are at a dinner theatre? Q8. What if I can't come Thursday or Friday, maybe Saturday. But, only in the evening. A. It will be okay, my friend. Every piece has numerous performance times. At least one each day. I think. Here's the schedule link again. Come to the Fringe or Into The Woods at Cool Beans or both! Live a little! We have 8 original pieces appearing in the 2015 Fort Collins Fringe Festival - most student written, acted and directed. More later. So we give actors "days"
We aren't sure how it started. But, young actors aspire to get "a day" named after them. Some are very serious about it. We give them when someone has an exceptional day or moment at la-de-da. Like they might come in completely memorized after a week or be working really hard in class or achieve some exceptional moment. Having exceptional moments and days. Something we hope for every la-de-da creator - actor, writer, singer, director - kid to adult. We work hard to make that possible. Today is Nick Dunnigan Day. It's the end of Late Winter session and we hope winter! Spring Session has to mean spring. Yes. We have an end of session showcase this week and ours may be different than others. 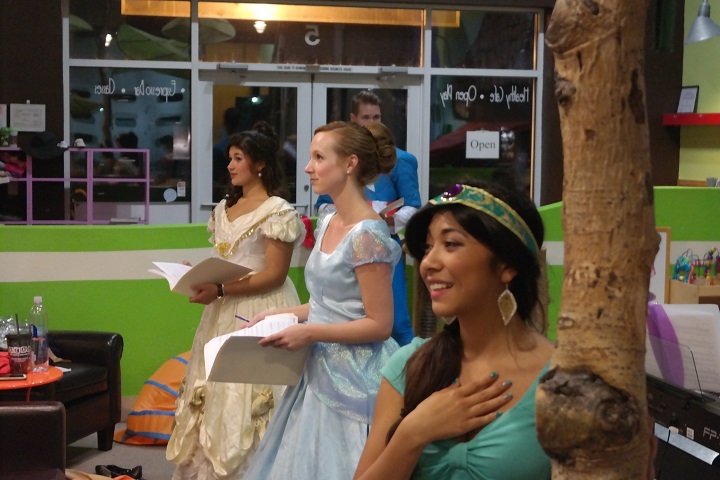 We have informal showcases for the student to experience an audience and experience entertaining them. We are not "entertainers" without an audience. But, we expect very good scene and song performances this week. For most, it's the last 30-45 minutes of class. Join us. Spring Session begins after PR1 Spring Break - March 24th. "Of course, if you like your kids, if you love them from the moment they begin, you yourself begin all over again, in them, with them and so there is something more to the world again." William Saroyan. "(the) transformation in kids from flashing dragonflies, so to say, to sticky water-surface worms slowly slipping downstream - is noticed with pride by society and with mortification by God..." William Saroyan. We are currently in the Late Winter Session until the week before Poudre R1 Sprink Break. And wow, what a group. All classes will be doing a "showcase" at the end. la-de-da is on break until January 13th. We hope you can join us for the Late Winter Session of workshops. Thank you all for a wonderful 2014. It was easily one of our best years for class attendance and just plain fun. With our new space and new neighbors, we look forward to an exciting 2015. NO Classes this week. Happy Thanksgiving! Nov. 25th-29th. A Musical Christmas Carol auditions are this Sunday. Time slots still available. Go here. The 2nd annual Fort Collin Gringe Festival was a pretty good success. Eveything was well attended and all our peeps did a wonderful job. It's not easy to write, direct and perform in your own piece as so many did. They kind of made it look easy. The Fringe returns next year. Start creating. Next? Another session of workshops is coming up. "A Musical Christmas Carol". And, in a cool partnership with Windsor Community Playhouse, we premiere "The Other Women" in mid-October. Watch for that.